Are company earnings going pear-shaped? 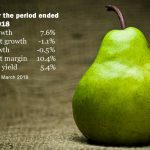 [Read more...] about Are company earnings going pear-shaped? Is the CGT cost base reset right for you? [Read more...] about Is the CGT cost base reset right for you?